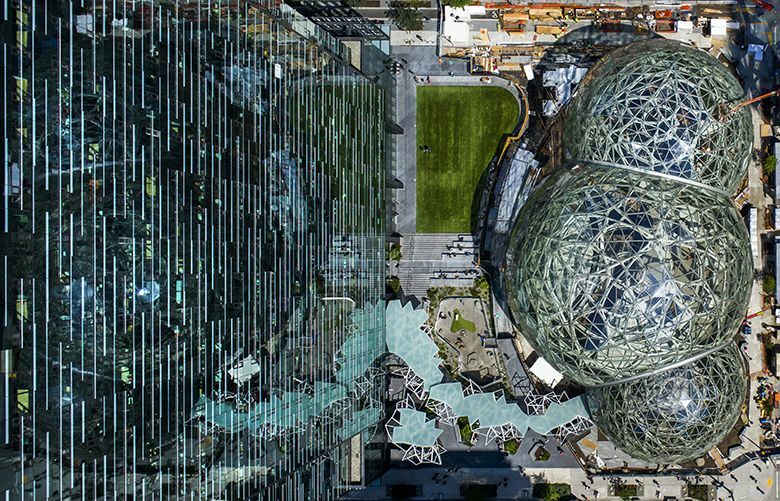 The substantial lease at the forthcoming Rainier Square development comes amid questions about Amazon’s planned growth as the company looks to build a second headquarters. Less than a month after opening up a hunt for a second headquarters, Amazon has agreed to expand in Seattle in a big way. The company confirmed Tuesday it has signed a lease for the entire office portion of a planned downtown skyscraper called Rainier Square that will become the second-tallest building in the Pacific Northwest. Even by Amazon’s standards, the expansion is substantial: Rainier Square will be among the company’s biggest office buildings when it opens in three years, with room for more than 3,500 additional employees. It’s one of the biggest leases in Seattle history. Amazon will occupy about 722,000 square feet in the development, which is in the early stages of construction. No other company in the city has a space that large in a single Class A office building. Amazon has been scooping up offices on a regular basis for years. It already takes up nearly 20 percent of all prime office space in Seattle, the most of any company in any major U.S. city. But the latest lease comes amid question marks over the company’s plans for its hometown city. Amazon said last month it would build a second headquarters somewhere in North America, which fueled speculation that the company might be slowing down or halting its growth here. The company’s job postings in Seattle have been dropping, from about 9,000 in June to under 6,000 now. Amazon billed the second headquarters as being a “full equal” to its Seattle hub and has been signing leases to open up more large satellite offices in places like Manhattan, Silicon Valley and San Diego. Previously, the e-commerce giant had planned to grow from its current footprint of 8.1 million square feet in Seattle to 12 million in the next five years — enough to surge from about 40,000 employees now to 60,000 later. But it hasn’t publicly talked about its local expansion plans since the HQ2 announcement. “I’ve walked away from this with a belief that they are still growing in Seattle now, clearly, and I think they are going to continue to grow,” said Greg Johnson, president of Wright Runstad & Company, which is developing the Rainier Square project. Even though Amazon is expanding elsewhere, “I don’t think that correlates exactly to a pullback or anything in Seattle,” he said. Amazon declined to comment Tuesday beyond confirmation of the lease. Brokerage Kidder Mathews reported Tuesday that Amazon is also “rumored to be looking at 300,000 square feet in another planned project” locally. “I think this signifies Amazon’s long-term commitment to their hometown,” said Jake Bos, a Kidder Mathews vice president. He thinks Rainier Square could be the second-biggest lease in the city’s history, behind another Amazon lease. Johnson said Rainier Square attracted “a lot of interest” by Seattle area-based companies, as well as outside firms that already have a satellite presence here. At least one other unnamed company wanted to take the entire office portion, he said. The lease marks Amazon’s first move into the downtown core, after taking up about three dozen buildings in South Lake Union and the Denny Triangle. 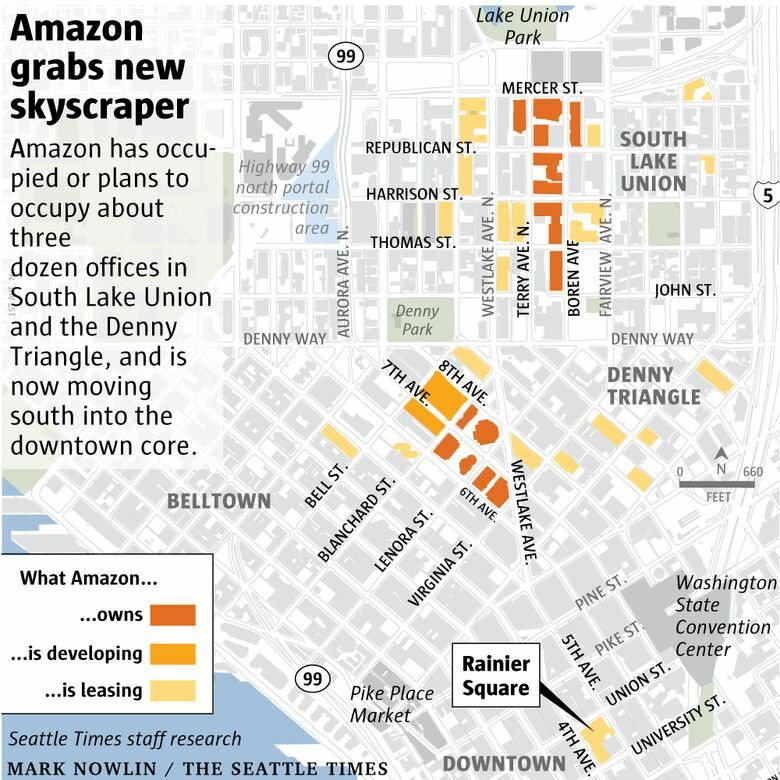 Rainier Square — at Fourth Avenue and Union Street — is about a half-mile south of any of Amazon’s existing offices. Office brokers have noted that while smaller businesses have been priced out of South Lake Union because of the growing tech scene there, central downtown had been somewhat isolated from the Amazon effect. That could change with Amazon now expanding into the downtown core. When Wright Runstad began planning Rainier Square three years ago, “the folks at Amazon really didn’t want to hear anything about it,” Johnson said. But then the company kept growing, and inching slightly farther south. “They’re already so large and they’re still growing at a great pace,” Johnson said. Rainier Square will stand out with its bootlike frame, featuring a wide base tapering to skinnier floors higher up. 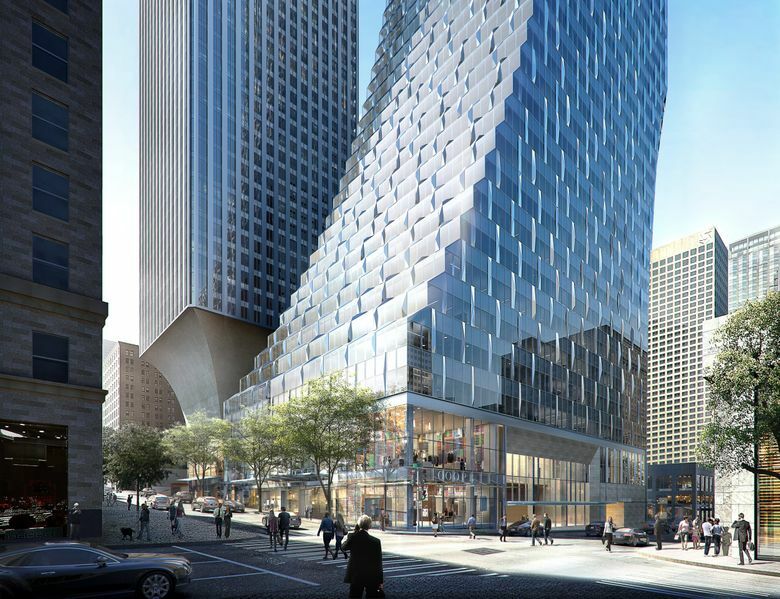 It will sit next to the existing Rainier Tower, known for its narrow, curved pedestal. The $570 million project, approved in 2015, is being built on University of Washington property. Demolition on the site has begun as crews knock down the existing Rainier Square shopping mall. Construction will continue through 2018 and 2019, and the office space is expected to open in summer 2020. The 58-story tower, which will also include 200 luxury apartments, retail and an adjacent luxury hotel, will be the region’s second-tallest building when it opens, after 76-story Columbia Center. Downtown Seattle is undergoing a record construction boom, with 74 major projects active as of July. Rainier Square is the biggest of those developments. It’s the second time in the last several months that a developer has leased out a new Seattle skyscraper before it even opened, showing how strong demand has become for job space in the fast-growing city. In May, tech company F5 agreed to take all 516,000 square feet of office space in a new building at Fifth and Columbia that will be called F5 Tower. Correction: This post has been updated to reflect that no other company has an office as large as 722,000 square feet in a single Class A office building. Business reporter Matt Day contributed to this report.